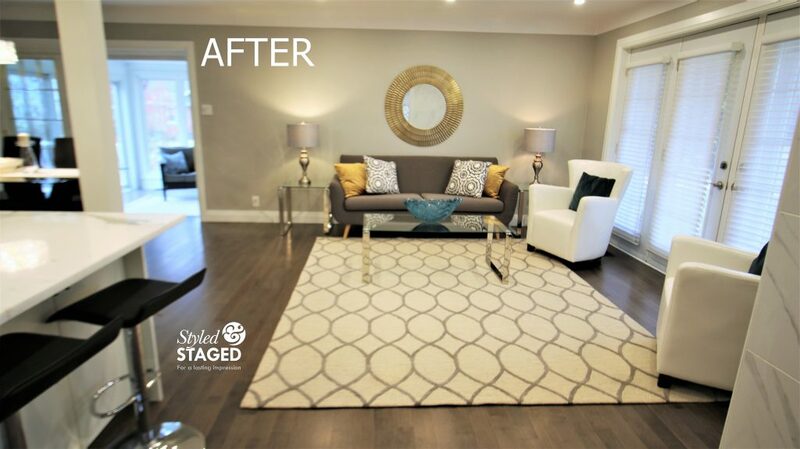 Home » Staging A Vacant Home Makes All The Difference. I was called by the homeowners to Stage their vacant property. 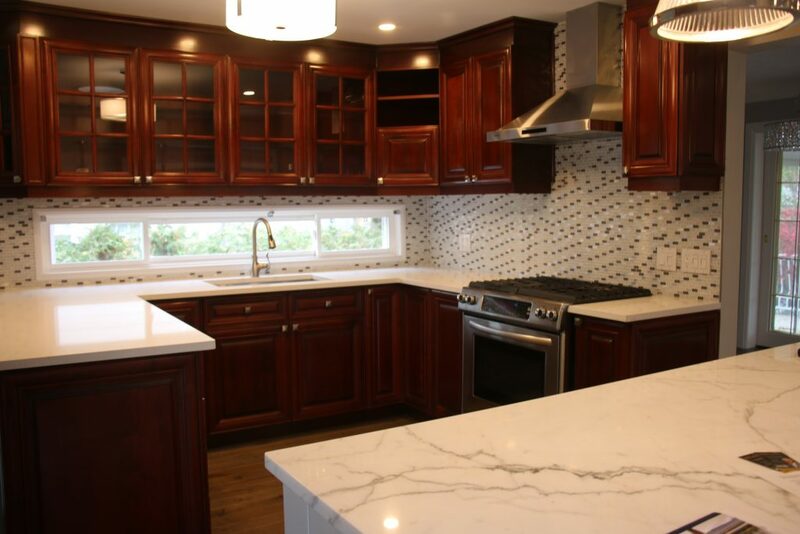 The house had just been completely renovated and was in pristine condition. As soon as I walked in, I loved their colour scheme and their light fixtures. 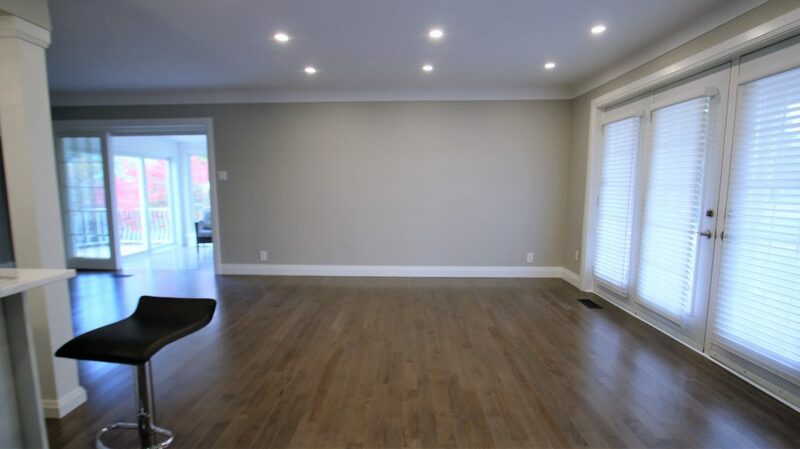 Buyers find it very challenging to see the full potential of an empty room since rooms always appear smaller without furniture. 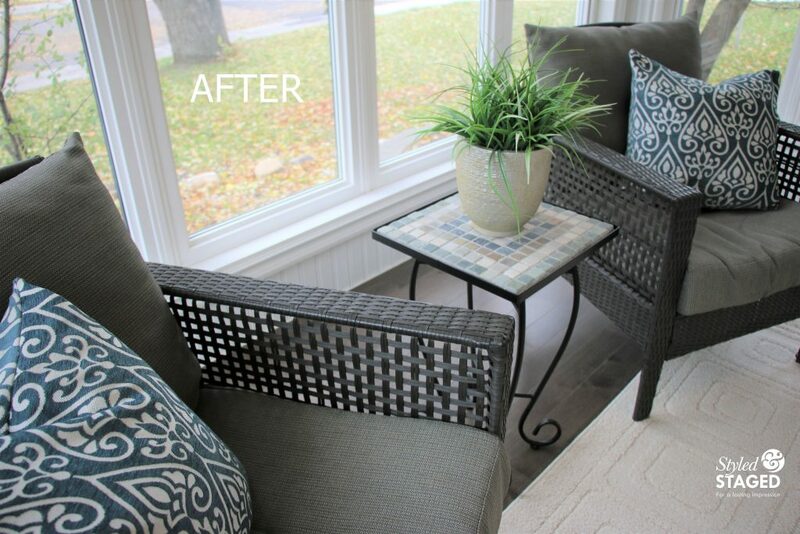 My job is to help make a house feel like a home and to enhance the house’s best features. The first thing I need to decide on is the ‘style’ and ‘colour palette’ that suits each house. In this case, I used the existing light fixtures, kitchen cabinets and finishing details like the tiles, appliances etc. to set the tone for the entire house. This is extremely important in an open concept since everything needs to flow. 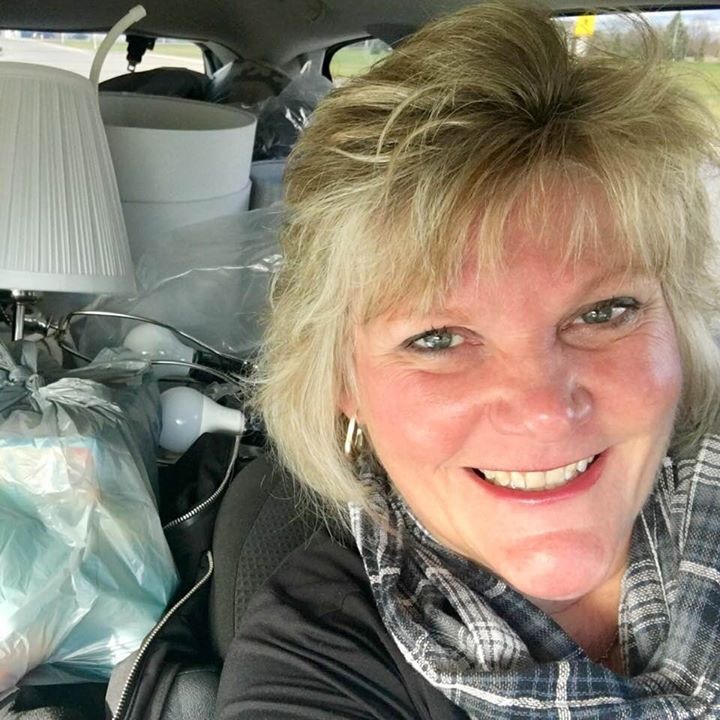 After spending time in the house and measuring the rooms, we went to the rental furniture store to choose the furniture that we wanted to bring in. Since the store’s inventory is constantly changing, I made several changes before the actual delivery date. I wanted the best possible choices for my client. It’s all about measuring, measuring and more measuring. 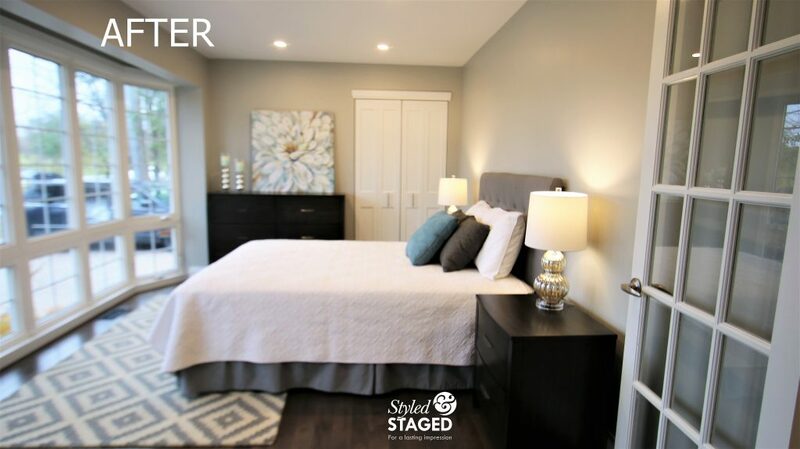 I love Staging day since I spend countless hours/days planning and visualizing each room in numerous possibilities and all the work and effort comes together quickly within a few hours on Staging day. I have to make sure I have every single item necessary to stage an entire house in one shot. Rooms are constantly floating around in my head and since I work on numerous houses at the same time, I am always juggling my own inventory to make sure everyone is happy. It’s actually a lot of pressure so it’s rewarding to see it all come together. 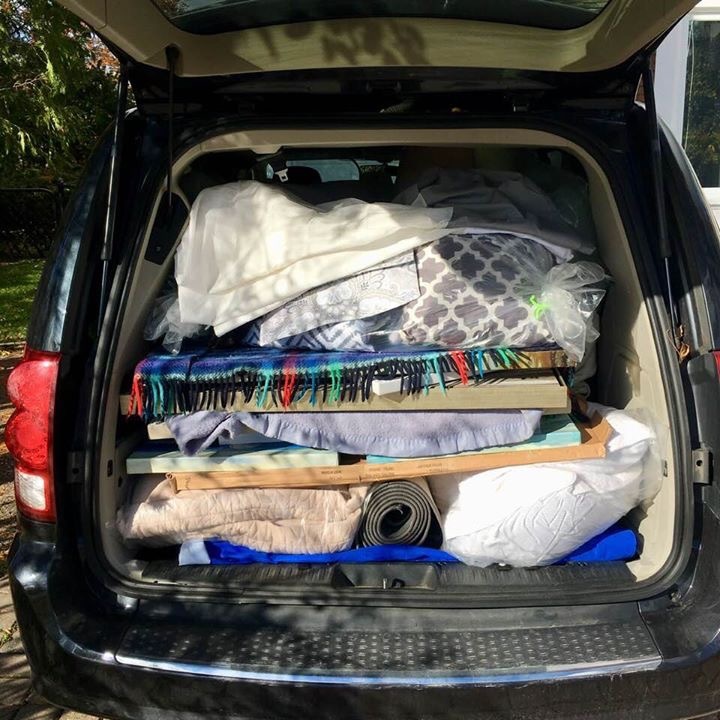 My van is packed to the roof and I can’t wait to get there with my assistant and meet up with the rental company. Can’t fit much more in the van today. The over-sized area rug defined the natural living zones. Don’t worry, you still see enough of their beautiful new wood floors throughout the entire house. 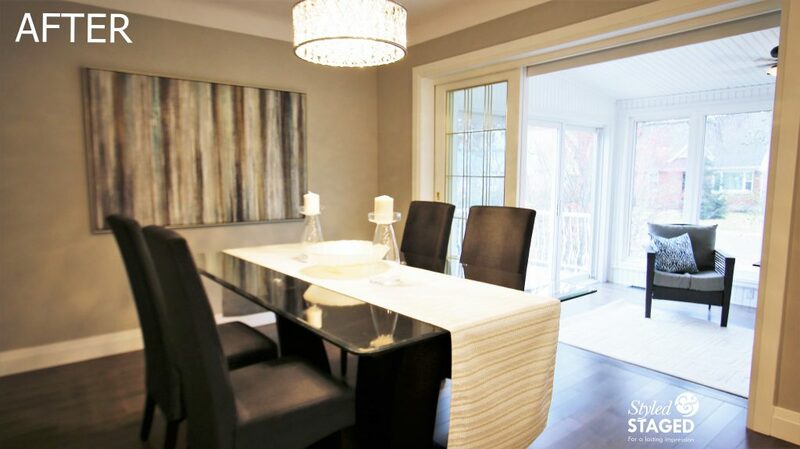 Area rugs not only creates a zone, they also lighten, soften and warm up rooms Ivory and gray were my main colours. Since the room was long, I needed a large carpet so all the furniture was able to sit on it. Otherwise, the furniture would have just been floating in the room. 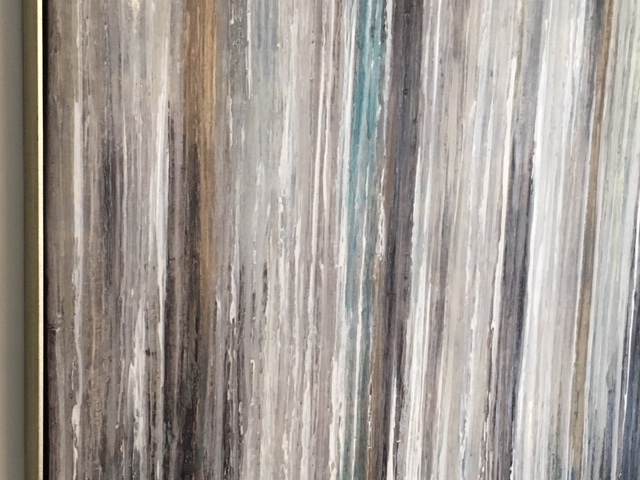 This huge piece of art that I hung in the dining room is the whole colour palette to the common living areas. 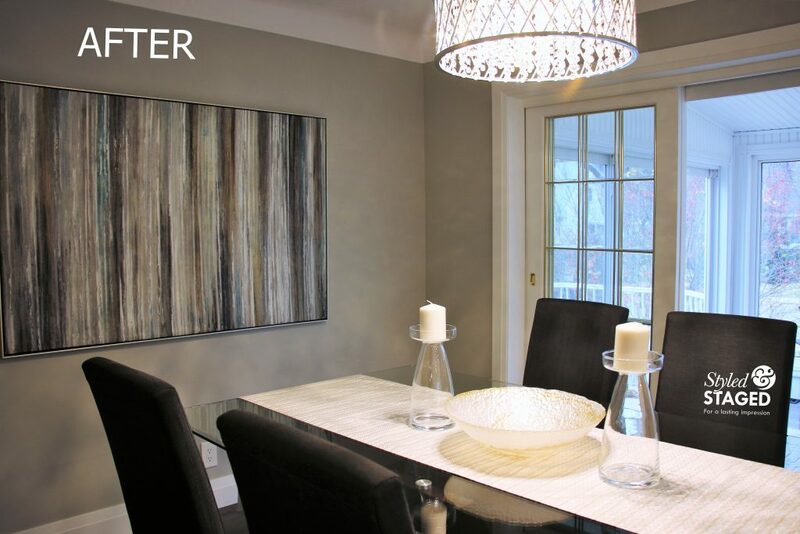 The artwork tied in the wall colour, the kitchen cabinets and gave me teal as the accent colour. 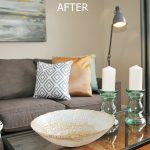 A large teal bowl of the coffee table and two teal cushions on the chairs in the living room tied the two rooms together for a nice flow. 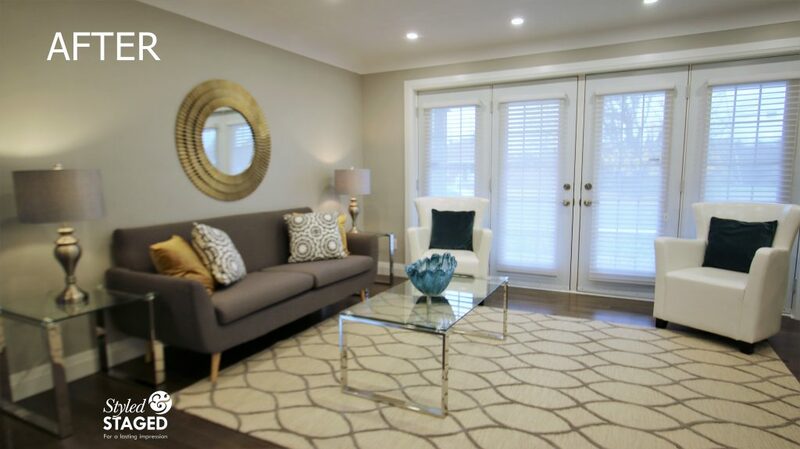 Since the area rug had a pattern, the decorative matt gold mirror above the sofa was all that was needed. It makes a statement all on its own. The mirror adds drama, texture and reflection. It reflected the exquisite gray marble fireplace on the opposite wall. Always be careful what you are reflecting when hanging a mirror. The lush gold velvet cushions tied in with the mirror as well. Rooms are more exiting when you mix your metals. It’s exciting to have pewter lamps with a matt gold mirror. 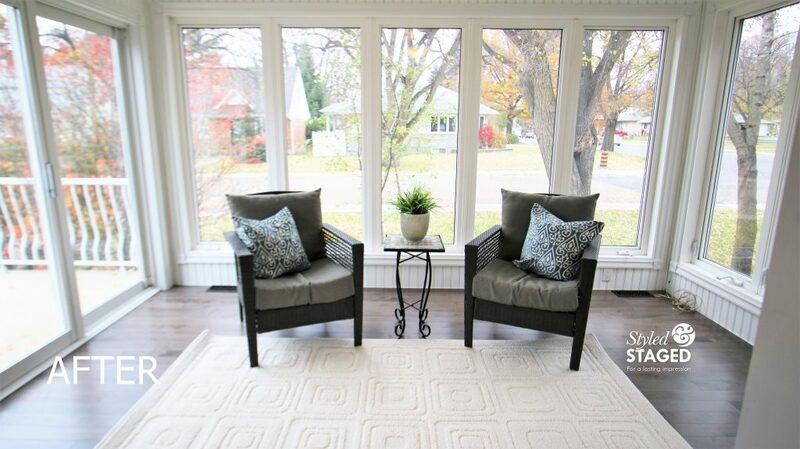 Glass coffee and end tables keep the room feeling light and airy and still allows you to see the area rug. You really need to measure your space well before renting/buying furniture. The original furniture that I had put aside would not have worked nearly as well as this more streamlined furniture. This furniture was not available when I originally went in to the store. I spend a lot of time with the rental company to make sure things will be perfect. You might even notice some of this furniture and rug from a previous post since it went right from that house to this house 🙂 I love it when houses sell so quickly. I purposely didn’t put any furniture in front of the two patio doors that open to the lovely outdoor interlock terrace. 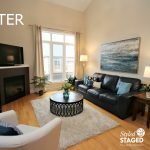 Buyers can imagine sitting by the fire on a cold winter day. I kept the dining room accessories simple since I wanted buyers to focus on the scale of the room and the elegant crystal light pendant. The kitchen was already perfect the way it was. 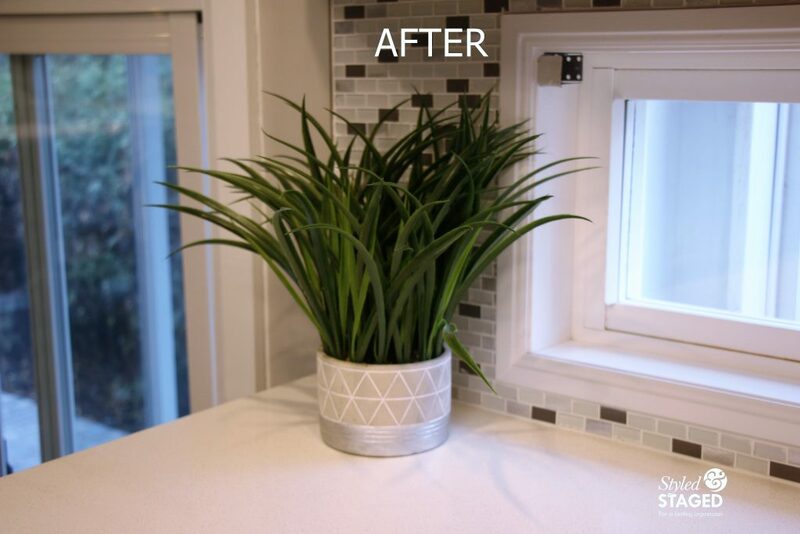 We just added a few accessories in the glass cabinets so they would stand out more, and added a few accessories on the counters. 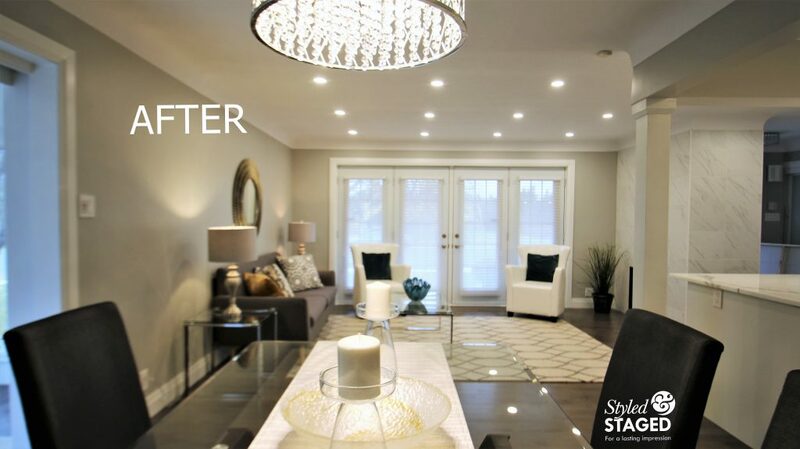 It’s important to draw the buyer’s eye all around the room. This home had two amazing sun rooms. Personally, I could see myself spending all my time in them. 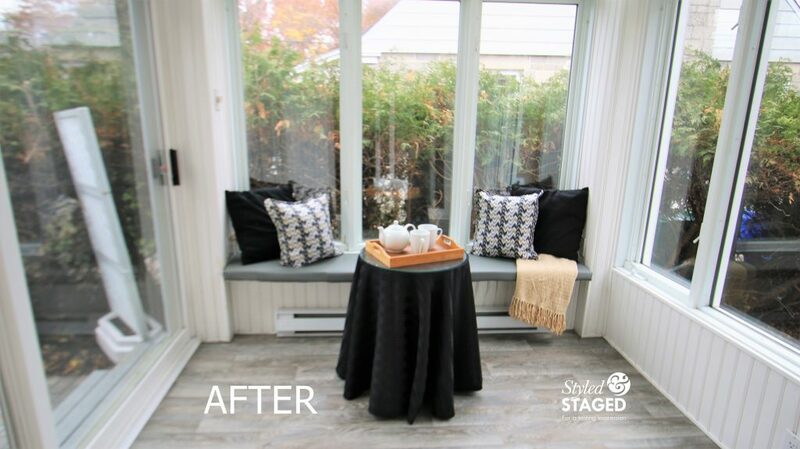 Since the larger room was off the dining room, I added teal cushions on their chairs to carry the colour through from the other rooms. 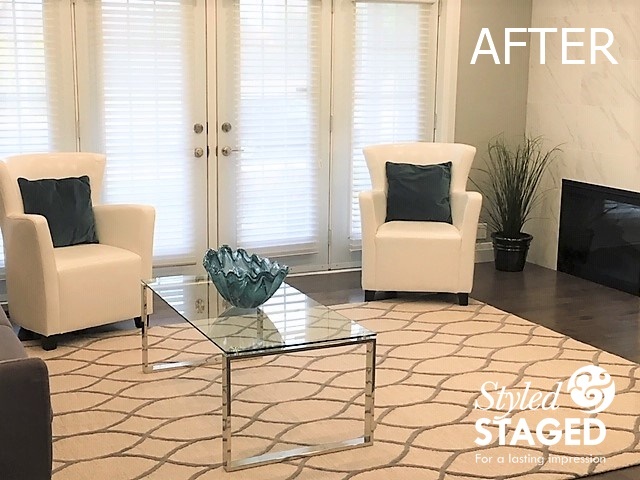 Simply adding an area rug made the space feel more like a ‘room’. Notice how little pops of teal are carried through from the dining room. 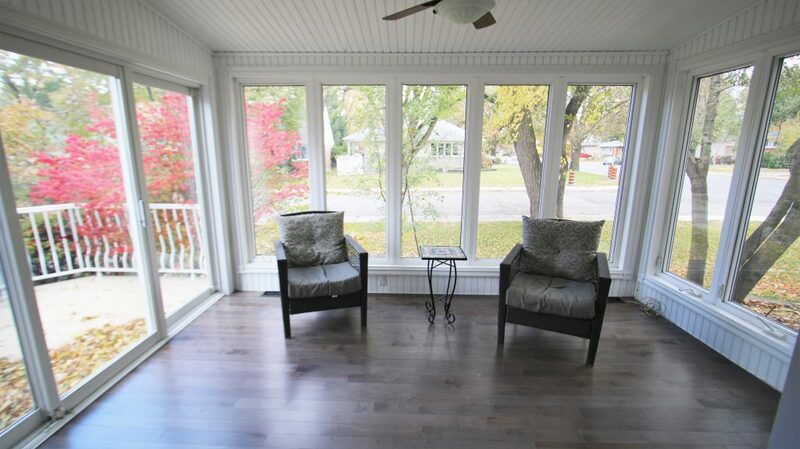 The smaller 3 season room with full windows is another space that is ideal to showcase. 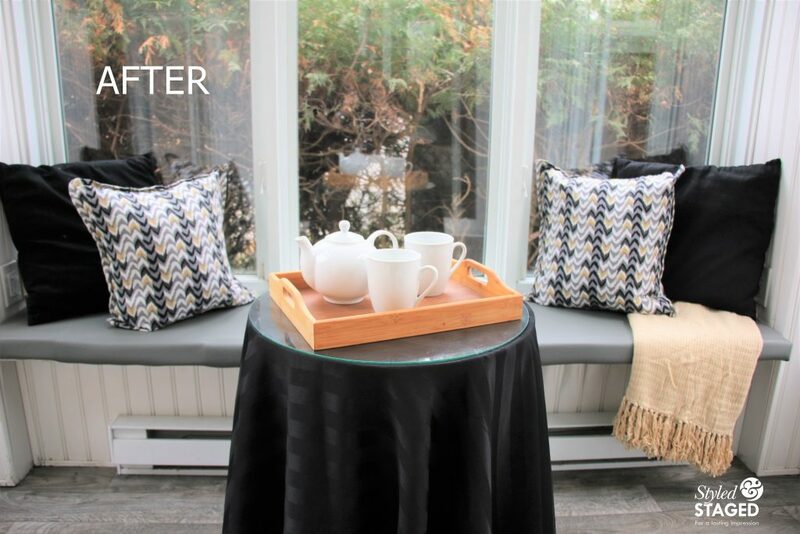 It already had a built-in bench so by adding a few cushions and a table, buyers could easily see themselves using this room when they wanted some protection from the outdoor elements but still feel like you’re outside. I pulled the same gold and gray from the living room. Adding a the black gave the room more presence and really felt sophisticated. This room is no longer a walk-through to the back garden. It has a purpose. 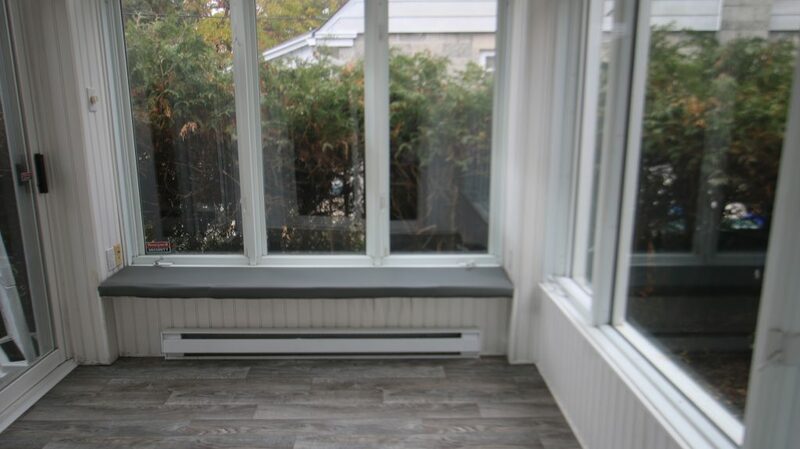 This is a perfect example of not being sure how much furniture would fit in a space. Now that the room is furnished, buyers can comfortably make an offer on the house since they know their furniture will fit. 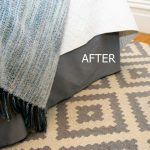 The area rug at the foot of the bed softens the room and gives some layers and texture. All the colours were pulled from the artwork. You don’t always need to hang the artwork. This dresser is higher than normal, so the art looked better just leaning on it. It also saves putting more holes on freshly painted walls. 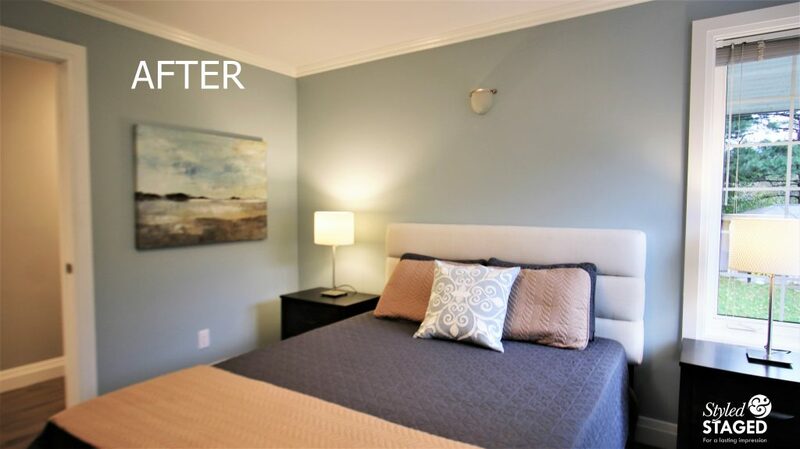 A few candles help create an atmosphere in a master bedroom. 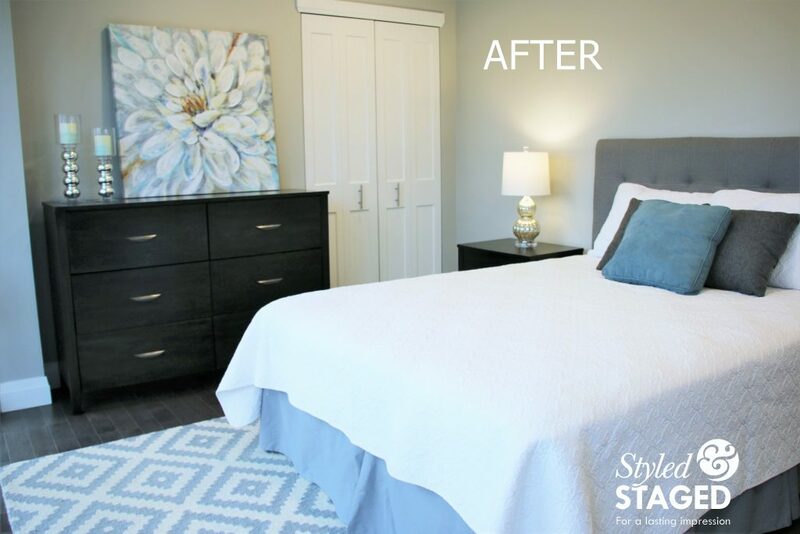 The homeowners wanted this room be show-cased as a second bedroom that could also work as a master/guest bedroom if the buyers wanted. After lots of measuring, we were able to comfortably fit a queen bed, 2 night stands and a dresser. 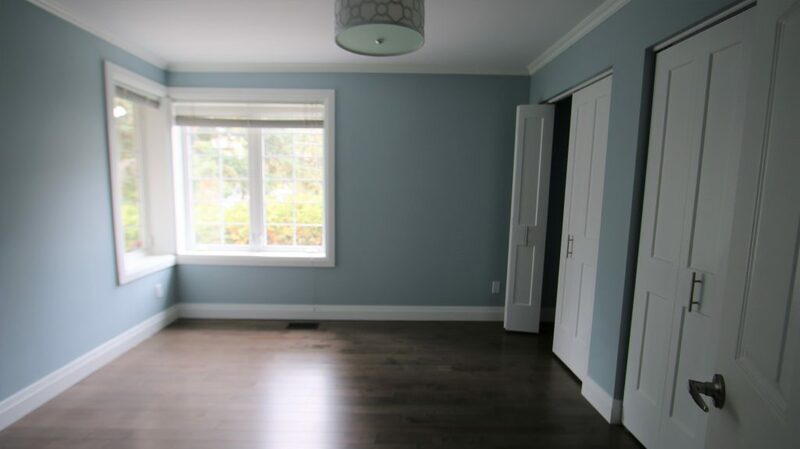 This room feels very soothing with the soft colour palette. 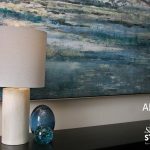 Since the other bedroom had floral artwork, I put an abstract landscape in this room. You don’t want all the rooms to look the same. It tied all the colours together perfectly. 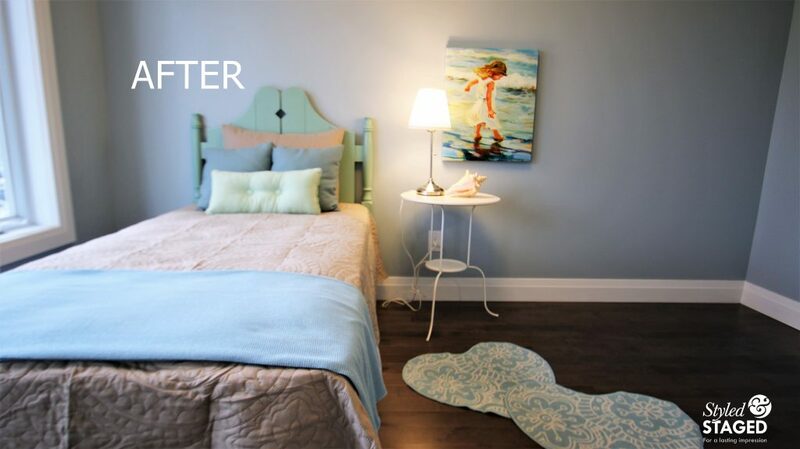 Layering solid coloured coverlets keeps beds looking interesting without looking busy in smaller spaces. Again, the headboard added luxury. 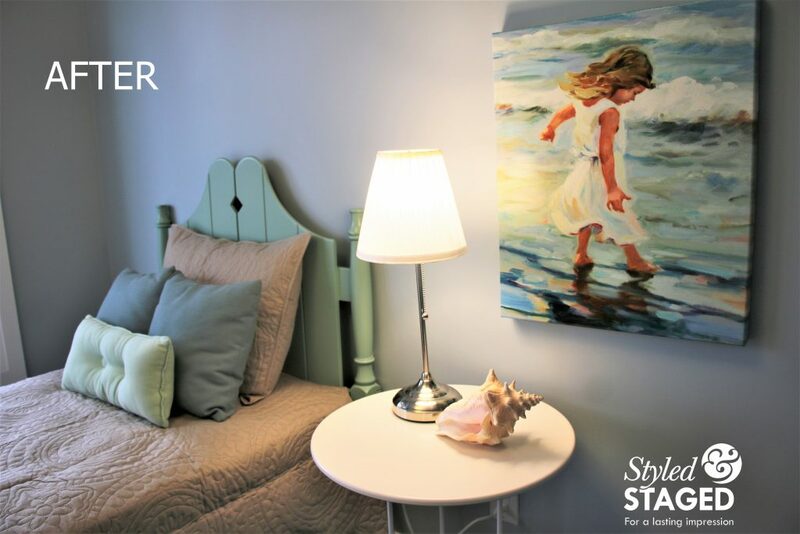 Whenever possible, it’s a good idea to put a bed in every bedroom so they are more memorable. 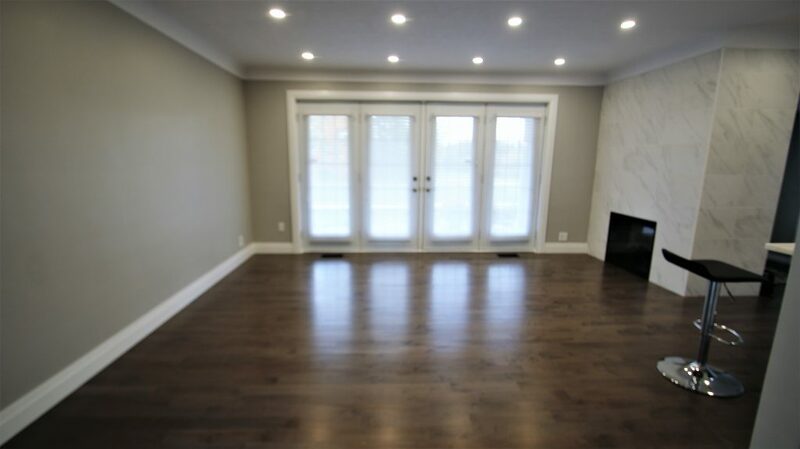 Remember, buyers are shopping on line for their house, so you want to make it impossible for them to forget exactly how many bedrooms there are. 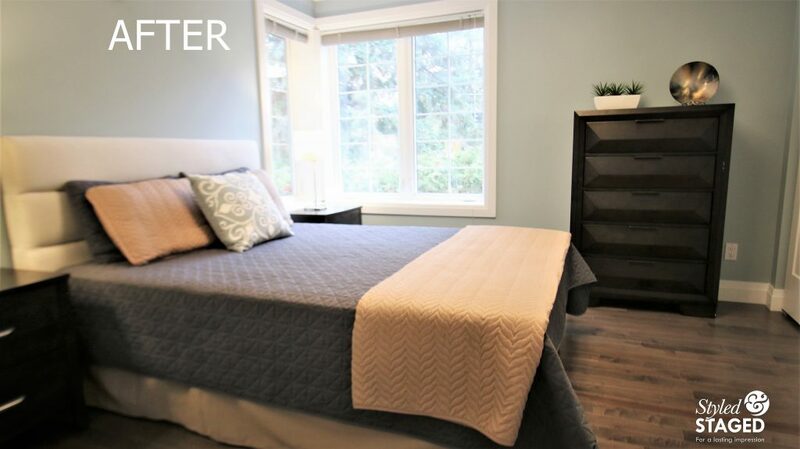 Bedrooms can always be converted into other purposes, but it’s harder to visualize a room with a bed in it. 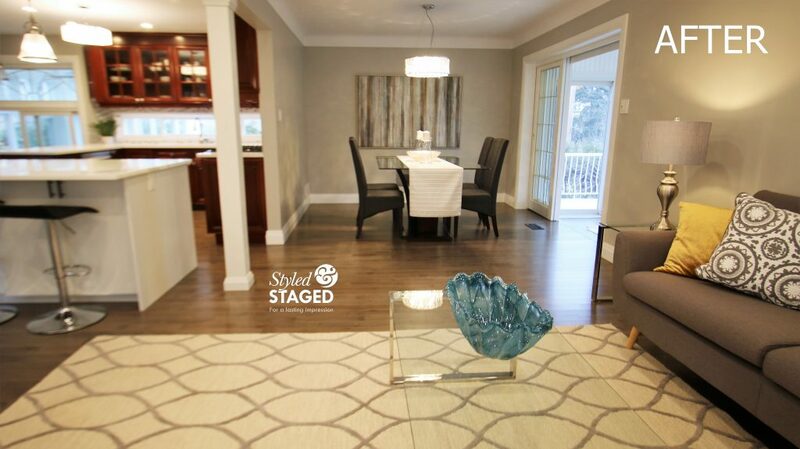 Always consider your Staging budget. 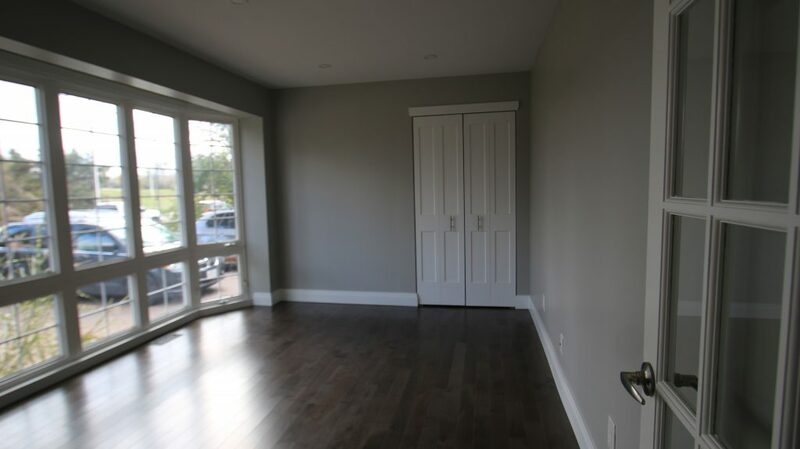 This room is clearly large enough to put a dresser, or it can be used as an office so there was no need to rent additional pieces. 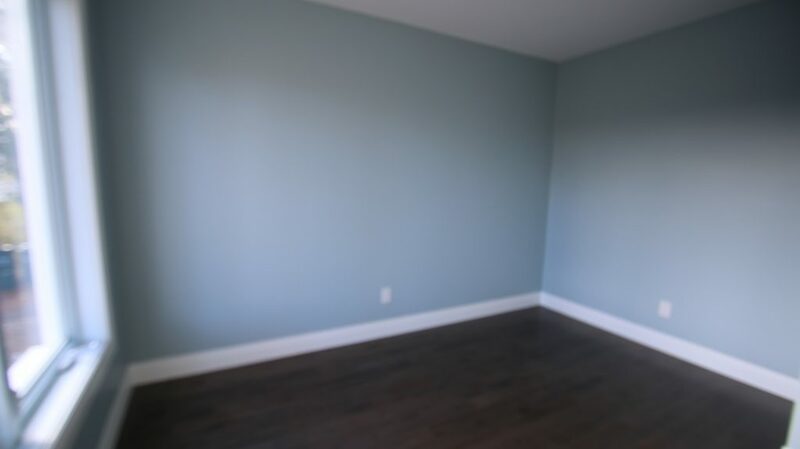 This colour palette is suitable for any gender or age once the furniture is removed. 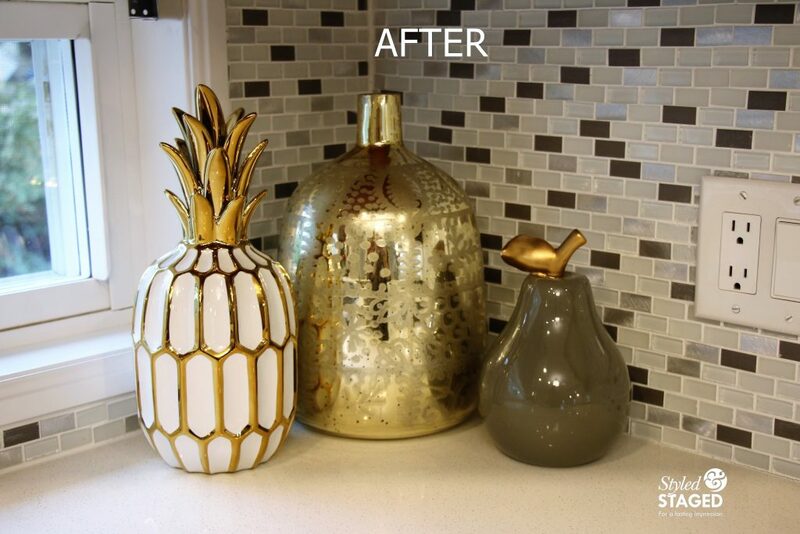 It only takes a few pieces to create a memorable space. Keep it simple. 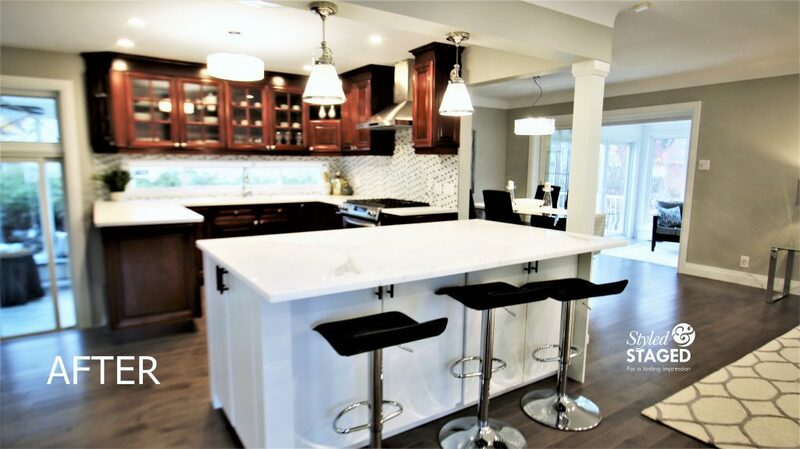 This upscale sprawling bungalow in a prime location is ideal for entertaining with the open concept and multiple extended rooms. 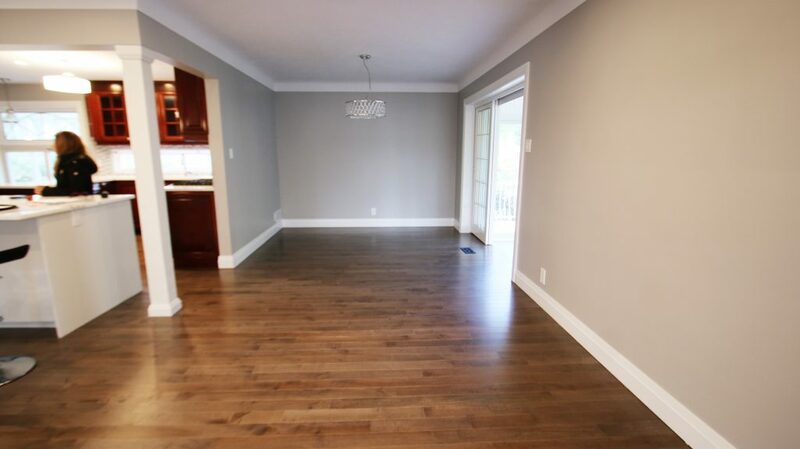 The entire lower level was completely renovated as well and looks amazing. Since those rooms are large and open, it really wasn’t necessary to Stage those spaces since they spoke for themselves. Again, consider your budget and spend your money where you will get the most value in return. I’m sure this beauty wont’ be on the market for long! I want to apologize for my poor quality photos. I just broke my lens and flash so some of the colouring is off, but I still felt that they showed the benefits of Staging.